My dearest friends, merry Christmas and happy holiday! Put our man in charge of the grill. Scented yourself with Coco, Chanel but not charcoal. Use ingredients that freeze well so as to prepare some food ahead, e.g. 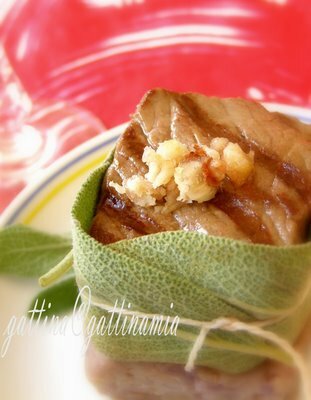 I decided chestnut pate as one of the side dish; a week ago cooked and freezed the chestnut. On the party day, grind it when it's still very hard (easier to clean the machine). Proceed to the finale. A big hug to your daughter and husband! Your dish looks beautiful - it must be a great pleasure to eat your food! Merry Xmas and a happy new year to you, too, and all your family! P.S. : I'll write that info on paper cases you asked for on that comment on my blog, ok? Hugs to you too and have a great time.See you next year. That looks delicious, I like the combination. Merry Christmas to you too! Love the sage casing. Nice touch! You always have nice touches. Happy Xmas!! Hope you have a wonderful Christmas and a stress-free New Year. G, Have a Blessed Christmas and May All your dreams come true. This photo looks very elegant. A very merry Xmas to you and your family. One giant HUG to you my friend. Joyous & Merry Christmas to you!!. Hugzzzzzzzzzzz & loads of X'mas cheer!!! This looks really delicious-very artistically arranged! Would love to make this very soon, Happy Holidays! but i don't eat beaf.........so can't comment any further. Kisses and Hugs to you too Gattina. Hope you have a great Xmas! What a beautiful photo. Very nice job, and I love the tips! Saffron, Patricia, Asha, Bea, Angie, Gini, Peabody, Anh, Sher, Edith, Archana, Lera, Sandeepa, Jann, Lakshmi, Meeta and Kristen, you guys just giving me one more sun... what a heart-warming season's greeting! Gattina, Merry Christmas you sophisticated lady you! Very good stress-free holiday preparations, esp. about taking care of you. Have a beautiful holiday! And a Merry Christmas to you, Gattina! Callipygia and Ivonne, this season is particulary warm with you ladies around! I had a excellent steak the other day at a fancy restaurant, and it had a bit of nut-butter-cheese with it, and it was absolutely brilliant. The sweetness of the nuts and the richness of the butter really made the steak taste so much better. This little treat reminded me of it, and for that, I'm greatful!